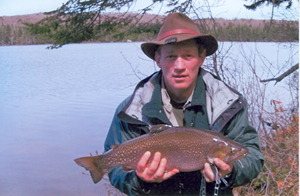 For the seventh time in eight years, the record for catching the largest brook trout in New York state was recently broken, state Department of Environmental Conservation (DEC) Commissioner Joe Martens announced today. William Altman caught a 5 lb. 14 oz. brook trout from the West Canada Wilderness Area in Hamilton County on May 5. "As today's new record catch demonstrates, there is a wealth of prime fishing in New York state," said Commissioner Martens. "I congratulate Mr. Altman on his success in catching the largest recorded brook trout in New York state and encourage others to take advantage of the many outstanding fishing opportunities New York has to offer." The record breaking fish was stocked as a fingerling by DEC's Rome Fish Hatchery and is considered a Temiscamie hybrid, a cross between a domestic brook trout and a wild Temiscamie (Canadian-strain) brook trout. These hybrids are stocked because they have a better survival rate than other strains of brook trout in some of the more acidic waters of the Adirondacks. Mr. Altman submitted details of his winning fish as part of DEC's Angler Achievement Awards Program, which tracks state record fish. Through this program, anglers can enter freshwater fish that meet specific qualifying criteria and receive official recognition of their catch and a distinctive lapel pin commemorating their achievement. The three categories that make up the program are: Catch & Release, Annual Award and State Record. DEC verifies potential brook trout state records by ensuring the fish is not caught from brood stock, which is large stocked fish, or splake waters, which are ineligible. Further information about the Angler Achievement Awards Program, including a downloadable application form, can be found at //www.dec.ny.gov/outdoor/7727.html. Program details and an official entry form can also be found in DEC's current Freshwater Fishing Regulations Guide. For additional information on the Angler Achievement Awards Program contact (518) 402-8891 or email fwfish@gw.dec.state.ny.us.